EIA predicts oil production at North Dakota's Bakken and Texas's Eagle Ford – the two largest shale plays - will decline by 1.3 percent. 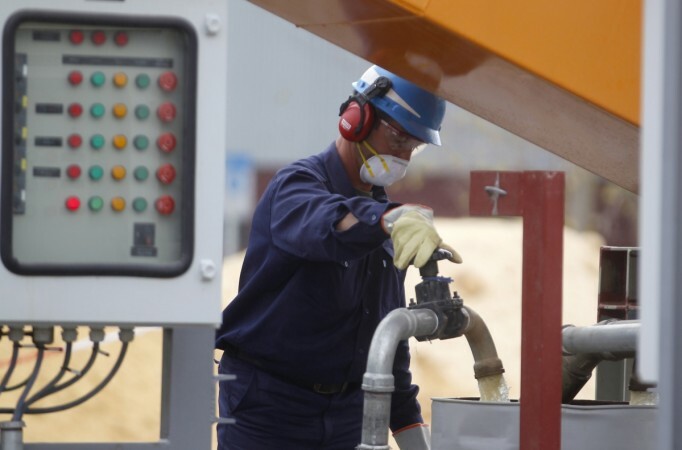 A staff member works at a pilot factory, where state-controlled energy company YPF is refining sand used in fracking, a process by which shale oil and gas is extracted, in Buenos Aires April 16, 2015. The US shale oil boom, which rattled global oil markets last year, seems to be fading, as output from it is expected to fall in July to 5.49 million, the lowest since January, according to the Energy Information Administration (EIA). The EIA predicts oil production at North Dakota's Bakken and Texas's Eagle Ford – the two largest shale plays – will decline 1.3 percent to 5.58 million barrels a day this month. The shale boom, which resulted in the US becoming the world's largest fuel exporter, is currently being pressurized by the Organization of Petroleum Exporting Countries (OPEC) decision to keep production unchanged. "Production has to come down because rigs drilling for oil are down 57 percent this year," James Williams, president of energy consultancy WTRG Economics, told Bloomberg. "Countering that is the fact that the rigs we're still using are more efficient and drilling in areas where you get higher production. So that has delayed the decline," he said. Many agencies including EOG Resources Inc., the biggest shale-oil producer in the US, hedge fund manager Andrew J. Hall and Standard Chartered have estimated a fall in US oil production after crude oil prices slumped last year. "We do not believe that the direction of U.S. oil output has changed," said analysts at Standard Chartered. "In our view, U.S. oil supply is still falling, and it is likely to carry on falling for the rest of this year," they added. Besides, the US oil rig count has been falling in the past 4 to 5 months, as drillers idled more and more rigs due to lack of supportive prices. Shale oil output will fall by 105,000 barrels a day in July after posting a 86,000 barrel drop in June, said the London-based bank. Oil production from the second largest oil field in the US, Eagle Ford in Texas, will decline by 49,000 barrels a day in July to 1.59 million, while output in the Bakken shale region of North Dakota is expected to fall 29,000 to 1.24 million, according to the EIA.